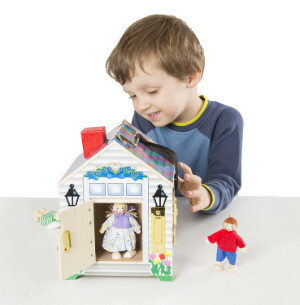 Melissa & Doug Doll house Reviews - Great for Girls & Boys! A dollhouse is one of the most wonderful gifts you can give a child as it will give them many hours of entertainment and fun. Children love to act out different scenarios based on their life experiences and their hopes and dreams for the furniture. Arranging the furniture and designating different roles to their dolls are all part of the fun. If this is a gift you are considering buying for your child, you will find a wide range of different dollhouses to choose from. However, one of the top brand names in dollhouses is Melissa & Doug. Their quality wooden products are highly rated by consumers and a little playhouse by this company will last your child for years. 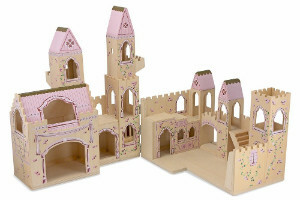 The Melissa & Doug Folding Princess Castle Wooden Dollhouse is a pretty wooden toy that has hinges to open and close. It features three levels, a working drawbridge, balconies, removable turrets, towers and an arched walkway. The dimensions of the Folding Princess Castle are 17.5 x 27 15.2 inches and it weighs 13.7 pounds. One of the biggest positives about this castle dollhouse is that it is gender neutral. While toy castles are often aimed at boys and dollhouses at girls, this is the perfect solution to combine these two toys and allow boys and girls to play together. The reviews are rather contradictory as some consumers say this castle dollhouse is really sturdy and has survived rough play over a long period of time. Others say that the pieces come apart easily and are poor quality. Putting this possible issue to the side, the castle doll house is the perfect setting for children to act out a wide range of scenarios, from family scenes within the castle to battles outside. This one-room, single-story dollhouse is the perfect toy for taking on your travels as it boasts a carry handle on the roof. All four sides of the dollhouse have a hinged door with its own lock and key and battery-operated doorbells. The dimensions of this dollhouse are7.2 x 7.5 x 7.2 inches and it weighs 2.2 pounds. 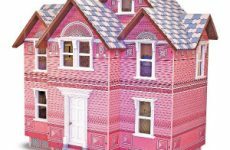 The Melissa & Doug doorbell house is a unique dollhouse as there is nothing else quite like it on the market right now. It is this novelty factor that will appeal to children, while parents will love the educational and developmental aid aspect of this wooden dollhouse. As this is quite a small and basic design, it is most likely to please toddlers. This is the perfect dollhouse for toddlers and its fold and go design makes it the perfect toy to take anywhere with you to keep your child entertained. The simple and basic design of this mini dollhouse includes four rooms on two levels. 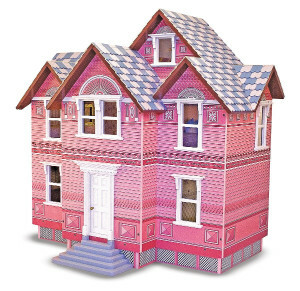 It includes 11 pieces of wooden Melissa & Doug dollhouse furniture and two flexible Melissa & Doug dolls. The dimensions of this dollhouse are 13.5 x 10 x 7 inches. Although there are some reported negatives relating to this dollhouse, these seemingly minor issues that would not spoil the enjoyment that a young child will experience when playing with this toy. Toddlers certainly would not notice that the furniture stands in the middle of the upstairs rooms. Due to its rather basic design, this is best-suited to toddlers who have fewer expectations than older children. It is also a good choice for people on a limited budget who want to buy their child their first doll house. Anyone who prefers a traditional-style dollhouse will love the Melissa & Doug Classic Heirloom Victorian Wooden Dollhouse. There are seven rooms over three levels in this intricately designed wooden dollhouse. Although you need to buy the furniture and dolls separately, Melissa & Doug do have an excellent range of wooden Victorian furniture, dolls, and accessories that are perfect for this dollhouse. You just need to consider the additional cost when making your purchase. The majority of customer reviews are very positive about this dollhouse as parents adore the pretty design and say their children spend hours playing with it. However, a small number of buyers have complained about the amount of time it takes to assemble and suggest that you do not begin the assembly the night before you give the dollhouse as a gift! The manufacturers recommend this doll house for children between the ages of 6 and 10 years. This colorful and fun dollhouse has six rooms over three levels and also includes a garage and a working elevator. As there are no side or front walls, children have the freedom to interact with their dolls and Melissa & Doug dollhouse furniture from every angle. The dimensions of this wooden dollhouse are 7.2 x 23.2 x 27.8 inches and it weighs 20 pounds. This dollhouse is best-suited to children between the ages of 3 and 6 years. The manufacturers warn that it is not suitable for children under the age of 3 as the small parts may pose a choking hazard. The generous size of this dollhouse means it is perfect for children to play together. The one downside to this house is the complaints about how difficult it is to assemble. However, this is a common complaint about the construction of large doll houses regardless of the brand. Split over three levels and with six rooms, this multi-level dollhouse gives plenty of play options for children. The pretty pink and purple house comes with 19 pieces of furniture and boasts five working exterior doors and two movable staircases. The dimensions of this dollhouse for kids are 28 x 28 x 15.5 inches and it weighs 11.5 pounds. This is a good choice if you are looking for a wooden dollhouse that is suitable for several people to play with at the same time. The quality of the furniture that comes with it is excellent; they even have working doors and drawers. The main complaint about this product is that the walls are flimsy. However, this conflicts with other reviews that say the doll house is really sturdy. 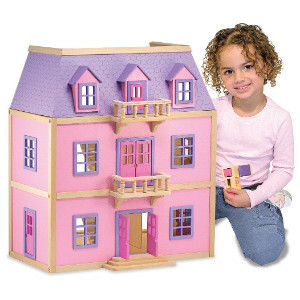 The Melissa & Doug wooden castle dollhouse is perfect for both genders and comes with a carry handle to take the castle with you wherever you go. Children can play with this compact two-story castle either open or closed and create a variety of scenarios with the play figures provided or their own dolls. The dimensions of the wooden castle are 10.5 x 13.5 x 7.125 inches and it weighs 4.5 pounds. 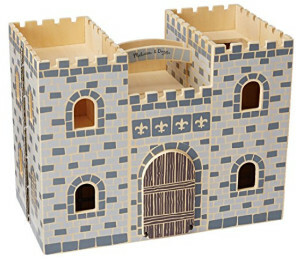 Some of the appealing features of this toy include a working drawbridge, a dungeon, and a handle to move the castle around. The accessories that come with the castle give children the scope to act out some great scenarios. Included with the castle are a king, a queen, two knights on horses, a royal bed and a treasure chest. Consumers are extremely positive about their experience of this wooden toy and say that their children love playing with the castle. Overall, Melissa & Doug have a great range of dollhouses to choose between that offer a variety of different play experiences. There is something for every child, regardless of their age, gender or personal preferences. There is also something to suit every budget. The reviews of each of the dollhouses are, overall, very positive with only a few customers experiencing any problems. 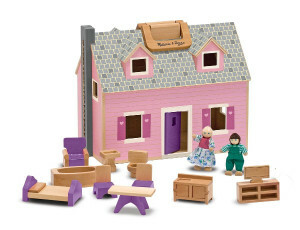 The main complaint relating to the larger dollhouses is the time they take to assemble, but consumers make the same complaints about large doll houses produced by other toy manufacturers. 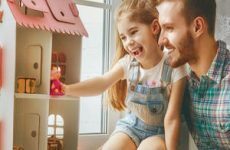 If you are looking for a smaller dollhouse for your child or you have a limited budget, then either the Melissa & Doug Children’s Fold & Go Castle or the Melissa & Doug Fold & Go Wooden house are probably the better options. People who want a traditional-style dollhouse will probably prefer either the Melissa & Doug Multi-Level or the Melissa & Doug Classic Heirloom Victorian Dollhouse. While the former includes furniture, the latter does not. You will need to consider this when making your purchase as if you opt for the Victorian Heirloom you will need to buy furniture and dolls.